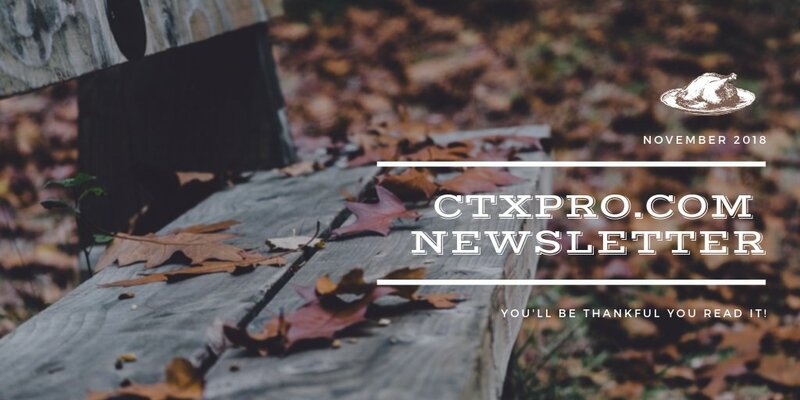 Greetings, and welcome to the first monthly newsletter for CTXPro.com! Though I’ve sporadically sent newsletters, I thought it was time for a new format and more regularity! So you can look for these around the first week of each month going forward. My intention is to let you know what is going on with me, with Citrix and feature new tools of interest. I hope you enjoy it! Folks, this is a big update. Lots of stuff going on. Here’s the November Newsletter Summary so you can reference back later or skip ahead. The word FINALLY is how I’d describe this one. Unfortunately, Cumulative Update (CU) 2 was not without some challenges. It took quite a while to get all of the fixes involved fully tested and verified. While CU2 was generally stable, CU3 contains nearly 200 fixes! The ones I saw most frequently involved mysterious black screens having to do, oddly enough, with a specific condition in User Profile Management. In fact, a large number of the fixes are centered around the VDA (Virtual Delivery Agent). Remember- Long Term Service Release is meant for those that want to have a more stable, long term need- support assured for 3 to 5 years. Current Release (CR) is for those that either desire or need to be closer to the edge of what is currently possible. Make no mistake- the features that are part of CR lately are exciting. Citrix really is innovating at an impressive clip. But because of that, the support lifecycle has to be reduced. Similarly, the Cloud release cycle is much more DevOps oriented- in fact the edge of what is possible. However, support is based on a ‘canary’ system, where updates are first tested on one group, then another. Releases are much more frequent and innovation abounds… but the catch is that the control plane is updated at Citrix’s discretion (you must still maintain your VDAs with whatever version you like, however to get the latest features you must update them frequently. Keep in mind that CR releases are highly recommended. However, I typically wait about a month for production release… just in case. That means testing these components in a Dev or Test environment dedicated for the purpose… or waiting for others to do the testing on your behalf out in the world. CU3 was released October 29th, 2018. Note that Cumulative Updates are primarily distributed as a single ISO file which can be used both to update and conduct completely new installs. Once you have the CU3 downloaded, in other words, you can discard the previous versions. Additionally, you can download the LTSR VDAs for Server or Desktop separately. I do get this question often so I thought I’d answer – YES, you can apply the LTSR VDA even if you are using the CR or Cloud release cycles. In fact, this is often recommended as you gain a more tightly tested VDA… however you will be subject to the feature sets and policies that are present with that VDA. So if you are wanting to take advantage of newer features (for example, some of the enhancements to HDX bandwidth usage) you will still need newer VDAs. You will therefore need to maintain your CR VDAs on a very regular basis. An all-too-common mistake I see with Cumulative Updates is actually in the application of license files. More specifically the SA Dates. So you have renewed your license purchase. Great! But very often people forget that when you renew the license you also need to download new license files to apply to your license server. Remember that Cumulative Updates are treated like new versions in terms of licenses, so they are coded to only be valid for the SA date of their release. So, your license file must have an SA date that is GREATER than the release, in this case if you have at least November 1, 2018 to be on the safe side! If that’s confusing let me know and I can create a video on it! As far as what is new- the most obvious is the name shift from XenApp and XenDesktop to CVAD – Citrix Virtual Apps and Desktops. Controversial in the same way other name changes have been, but all part of Citrix’s new naming system which takes additional branding away so it is just the brand Citrix and then whatever function. I have to admit… it’s growing on me more than I thought it would. As for more-than-a-name changes, anything new is currently described here: https://docs.citrix.com/en-us/citrix-virtual-apps-desktops/whats-new.html (though I must point out that following this link after the next CR release will bring you to that new release instead of 1808.2… something I may bring up with Citrix very soon that these links should really redirect to the latest version so that the document links remain more static). So what changes am I most excited about? I would say the new metrics for Logon Performance that are FINALLY giving more detail regarding which GPOs are slowing you down and for those with NVIDIA GPUs, support for NVENC encoding. I’ve seen this save not only bandwidth but in one recent case nearly 30% CPU savings by switching to NVENC encoding. One of those ‘can’t believe my own eyes’ moments. Two interesting things of note- MCSIO write caching is now disabled by default. You must specify at install if you will be using that feature. The key consideration is that while it does improve performance, it does also tie each VM to a host in most cases. Additionally, Smart Scale for on-premises installs are no longer supported as of the end of 2018. While I’m not thrilled about this completely, in truth I haven’t been aware of too many using it outside of Azure. Though it was a little rough of a rollout, Workspace Environment Management is now available for Cloud Services. This is a big deal, because deploying WEM locally can be challenging. It is very picky about database and has it’s share of challenges. With Cloud WEM… I was up and running in under 30 minutes. No joke. One fun gotcha about WEM in the cloud is that the interface is more or less the same. The problem here is that you are using the HTML5 Receiver for the connection, so local resources (Drives, clipboard) are a PAIN to get to. Unfortunately, you still have to load the WEM templates from a local endpoint, so there’s a whole painful procedure to go thru with that. I’m trying to get a non-customer environment for you so I can show you how it’s done but… that’s a whole other bit of drama I’m afraid. But I can tell you from my experience so far that is works well. It uses the same Connectors as the other services, so what you have to do locally is simply put in the GPO settings and download the latest WEM Agent for your VDAs. Then configuration is done per usual. WEM is a great service for a lot of things. At some point I’ll have the extra energy to put up some more detail about how I use WEM, but honestly- it has been worth it for the CPU, Memory and IO control. This just made it waaaaay easier to get going, so it does add some value to the Cloud Service story. Enough for me to tell you to upgrade? Let’s not push it. This is not a one-size-fits-all scenario. Choose carefully and if you are stuck, reach out to one of us in the CTXPro community (or join our membership!). There are a few new features of note here, most notably support for TLS 1.3 and other tools with SSL that make life a lot easier. Read up on the new Cyphers and DTLS support (yay!) here. I have to admit that of things I think you should know, that’s about it for this month. The rest are either lower impact or smaller radius improvements; but I can tell you that Citrix is very active right now development wise. Perhaps next month we can talk more about it. I recently found out that the most common search for me was “DJ with Citrix” so I thought I’d address a few things going on with me in the last few months. I am continuing to do some occasional work for Citrix Consulting as a third party / Ad-Hoc consultant. However my focus has been more on you, the individual lately. New eBook with about 500 downloads. I’m really pleased to announce that my new eBook “Become a Citrix Hero: Top 3 Citrix Mistakes and How to Fix Them” is a real success! This may be because I’m giving it away free. But I believe it’s because people really do want to know what recommendations I’ve been giving most commonly. This is not secret knowledge but it is the first time I have ever compiled it together. The eBook was also featured as part of a LoginVSI webinar about Intel L1TF, definitely something you should watch. It’s available for free on YouTube (Mark points out the book around 31 minutes in). Make sure you subscribe to their channel as well! Speaking of LogonVSI- they have a webinar coming up on the 15th on their new product release Login PI R3 for deep application performance testing. Emailing Leading Practice Advice & Tips. Along with the eBook I’m sending emails with reminders to actually take action on the recommendations I’m making. I understand people get busy and forget, so I’m taking the time to remind people. In addition, I’ve been hosting live Q&A sessions for questions people have and then posting the recordings. In the coming months, I will continue sending a quick tip every month based on my consulting experiences. Deep Dive Citrix Hero Subscription coming soon! This is exciting, but one thing I’ve noted in feedback I have gotten from the book is that people appreciate being walked thru what to do. So very soon I’m going to be releasing a service along with the monthly tips that will go into the same or more detail as in the book. As you probably guessed, I can’t hope to do this for free. I’m looking into future sponsorship opportunities but for the time being I’m planning to make this a direct service where people like you can invest in their own careers and becoming better at Citrix… without having to search endlessly for how to do it. I hope that will be of value to quite a few of you out there and I’m investing in the infrastructure to deliver it at the end of this month! Membership 2.0. Some of you may be aware that I launched a beta of a membership service for CTXPro.com this summer. I’ve been incorporating some feedback, working with a team to build a better structure to add more value. What is membership? The concept is simple enough- going beyond just technical tips to the deeper knowledge required to succeed in a career centered around Citrix. This means teaching things they don’t give you in the courses, and in way more detail than I can do in a blog… all with ongoing support and access to coaching. I’m excited to see the impact this will have on the Citrix community as a whole… but I’ll be honest- getting the message out has been very difficult. So I’ve been investing in coaching of my own; literally thousands of dollars on coaching and education on how to build these platforms. Add the time in of lost income to put this together and you’ll come to one conclusion: I care a LOT about making this a reality. I believe it is the culmination of my years of experience and I’m going to give this everything I’ve got! Those that invest in their career prosper at an extraordinary rate and I want to give you that opportunity. I’d love to do it for free, but that’s not going to be possible. But with access to me as your guide, I believe you’ll get way more value than what I’ll be charging. You’ll be advancing in your career faster than ever. Charging more for your work, even taking on new positions you never thought possible with myself and the community as your guide. Coaching. As I’m doing less consulting and more community development, it is finally opening up more time for me to devote to coaching. Watch for GROUP coaching opportunities coming soon. Group coaching is a way to not only support one another in growing but to share the financial burdens. I’ll be trying this out in a beta group in December so watch for that! Book. Yeah, finally. I’m going to finish my book. I’m working with a writing coach and am going to get this book on IT Methodology done by the end of the year. Watch for an invitation to become part of my ‘launch team’ to get exclusive bonuses that won’t be available elsewhere when I launch! More on that to come, but more importantly this will be my focus for additional courses soon. The reason is I believe that the methodology is core to everything I teach, so it will be important to get those out there! Every year I conduct a survey of my readers. Given that I have so many more of you lately I wanted to put out the survey I typically do in January a little early! The survey is a great way for me to not only learn how best to serve you by creating content that is relevant to YOU. I encourage you to fill out the whole thing, but I’ve put together this year in such a way that you have the option of being completely anonymous. Don’t hold back! Tell me what you think! I can’t improve what I’m doing without knowing more about your needs, opinions and desires for improvement! Okay- I’m pretty excited about this one. This month’s tool is not only great but it’s free and backed by a trusted company to boot. Logon Simulator is a free tool that performs a function Citrix used to publish with EdgeSight for Load Testing where logons can be simulated remotely on a schedule and reports generated. The tool can even alert you via email when things are not performing correctly. The interface is beautiful. I love the rounded circle around the user which helps you easily see which areas are taking the longest and which require your attention right away. Just click on the magnifying glass icon to get to this view. Please note that I’m currently evaluating this tool so I don’t have all the details yet. They only recommend running the agents on machines that are dedicated to running tests. I’m currently running mine on a Windows 8 VM. The idea is that the tool logs into your Citrix environment at certain intervals and launches the programs you specify. If you are running a web browser and the test is activated (which is done remotely) you will lose your browsing session. So this is NOT for your work machine but either a VM or better yet- a good use for some of those old laptops you have laying around at the office. Bring one home and install the eGInnovations Logon Simulator agent; let it run in the background and you’ll be able to see real-world logon simulations. BUT HERE’S THE THING: Configure the email alerts! You’ll get PROACTIVE notifications when logons are not performing like they should or other problems are occurring. And the best part… It’s free. eGInnovations wants you to experience a little bit of what they can do and I’m pretty darn impressed with the fact that they offer this tool for free. You’ll also notice I didn’t mention any need for agents in the datacenter. I literally mean you get a free account with the link above, install the agent onto your test machine and configure the logon information. That’s it. No more installs running. Everything else runs in the cloud which I have to admit, is really cool! Feel free to check it out. I am currently conducting a detailed customer review of eGInnovations and I’ll be sharing the results sometime soon with everyone. Whew! This has been an amazing season for me. Thanks for reading this far. If there’s anything I can do for you please don’t hesitate to ask. And if you didn’t get this post via email, I’d highly suggest you subscribe! To subscribe just go to http://www.citrixhero.com and you’ll be sent my ebook and registered for my email list all automatically. Subscribers: Watch your inbox for a Cyber Monday deal that I am REALLY excited (and nervous) about. We’re talking me allowing my subscribers access to over $6000 worth of my training, membership and tips for well over 90% off. 4 days only. If you aren’t getting our emails and are on my list, please let me know. I need the feedback so I can give it to my service provider. I have not decided yet if I will promote this deal outside of my email list. It’s a little too huge for that. But… I may do a flash sale during Cyber week… keep your eyes peeled!